STEVE MAGOFFIN produced a magnificent display with the ball to offer Sussex some hope in their County Championship match with Durham. The Aussie dismissed Mark Stoneman, Keaton Jennings, Paul Collingwood and Michael Richardson with his first 16 balls to leave Durham struggling on 60-4 at tea on day two, a lead of 160. Earlier in the afternoon, Chris Rushworth claimed his sixth wicket of the innings soon after the lunch break when Magoffin nicked one straight to Paul Collingwood at first slip. Sussex did manage a late onslaught with the two new loanees, George Dockrell and Tim Linley, offering some resistance. They put on 40 for the final wicket and that was just enough to help their side to a batting point. 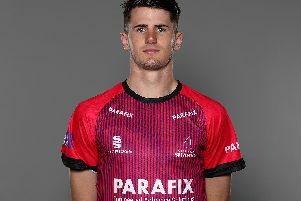 Dockrell ended unbeaten on 37 and was the top-scorer but when Linley picked out mid-wicket on ten he was left stranded and Sussex were all out for 201. Rushworth was the stand-out performer with the ball and his figures of 6-49 in 21 overs showed that. Durham, who went into their second innings with a lead of 100, did not start well with the bat. Magoffin ran in and produced a fine first over as he dismissed Stoneman and Jennings in the space of four deliveries. Stoneman nicked one to Luke Wright at third slip, while Jennings was caught behind with neither troubling the scorers. It got better for Sussex as Magoffin sent Collingwood’s middle stump flying to leave Durham 11-3. Magoffin then rounded off a fine first 16 balls when he got one to nip back through the defences of Richardson to leave Durham in all sorts of trouble. However, since being reduced to 13-4, Scott Borthwick (31 not out) and Gordon Muchall (25 not out) have steadied the ship and their side lead by 160 with one session left on day two.